Its creators sometimes worry that modern dance will be lost on many people. So what does a first-timer make of Emma Martin’s ‘Tundra’, the opening show at Dublin Dance Festival? I’ve picked up the tickets at the kiosk. The match programme is tucked under my arm. And if there were a merchandise stall hereabouts, I’m sure I’d have bought the T-shirt. With show time at the Samuel Beckett Theatre rapidly approaching, only one minor detail remains unclear. What is this spectacle that we are about to enjoy? What is Tundra, apart from the opening show of Dublin Dance Festival? Details are vague. Emma Martin, its choreographer, told The Irish Times last weekend that “Tundra is an in-between place, a metaphorical purgatory where you have to work through your difficulties to move on.” A brief aside. Although I am attending this evening in my capacity as The Irish Times’s designated pleb-for-hire, I have a family member who is an artist. And when she has an exhibition or installation coming up she often asks me to proofread her official blurb. When I encounter a sentence like Emma Martin’s, which is often, I tend to strike it out in red pen and scrawl “What the hell are you talking about?” in the margin. I mean, is she going to sing a song? Tell a few jokes? Do some magic tricks? A little exposition! Some short descriptive sentences, please! This isn’t to grumble about international art English. Plenty of people have done that already. (And Martin is by no means a bad offender.) It’s merely to illustrate the chasm that can exist between a contemporary artist and the public. Martin told another interviewer that people are reluctant to watch modern dance because they “fear that they simply won’t understand the meaning”. Again, that statement seems to be predicated on what, for the artist at least, is the flattering assumption that most of us have an inferiority complex when it comes to contemporary arts. With respect, I would suggest that isn’t necessarily the case. On Dublin Dance Festival’s opening night this week, with God knows what in store, and a stark warning posted that there will be no intermission, the only thing I’m intimidated by is the prospect of being bored out of my skull for 70 minutes. But for now, at least, I’m thinking happy thoughts. To the dance! To the dance! The auditorium is dark and quiet, with 150 expectant bums on seats. A veil is drawn in front of the stage, and three musicians perch on a tiny balcony to the side. After a brief safety announcement – in the event of a fire, patrons are requested to pirouette daintily to the nearest fire escape – the show is under way. Proceedings initially are rather subdued. There is a lot of wailing and gnashing of teeth, and people hurling themselves on the floor for no obvious reason. Various characters, at various points, appear to exert a gravitational pull on one another. The white-haired old man sits upstage, not interacting with the other characters. (Is he their jailor?) Three mourning widows flit across the stage, intermittently and inexplicably. All the while a loud humming sounds overhead, as though a helicopter pilot were trying to land on the roof of the theatre. It’s chaotic and utterly confusing. The tempo increases. The dancers’ athleticism, which was scarcely apparent in the show’s first half, comes increasingly into play. People lift each other up and put each other down. They bend backwards like limbo dancers. Then they smoke more cigarettes and stare into the television as though trying to make sense of the world outside. This isn’t going to end, you sense, with any big reveal. Finally – spoiler alert! 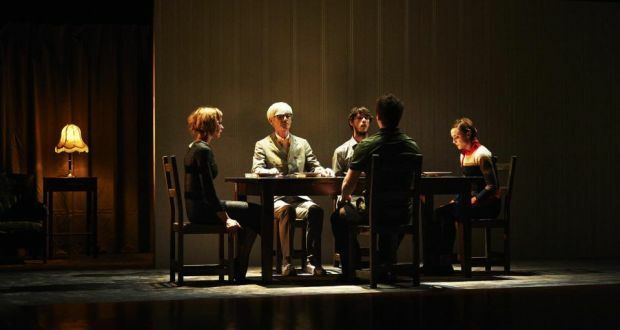 – the old man joins the four main characters at the table. The widows shuffle through one last time for good measure. And that’s it. Our business is concluded. So let’s move on. There’s talk of wine and cheese somewhere round about. Now we’re talking my language.